Rio Pro ID and smart card printer - The industry standard for high volume, high-speed ID card printing, backed with a comprehensive warranty package. Excellent print quality is secured with a unique custom watermark and multiple smart card encoding options. The Magicard Rio Pro’s patented HoloKote security technology adds a watermark to the card as it is printed – it requires no additional consumables and can be customised to an individual logo design – enabling true security at no extra cost. Secure encoding options include magnetic stripe, contactless and smart card technologies. USB and Ethernet interfaces are complemented with a Microsoftcertified plug & play driver. Batch print with the interchangeable 100-card feeder or print one-offs or rewritable cards with the hand-feeder. Upgrade a single-sided Rio Pro to double-sided printing using a simple in-field upgrade kit. Built for professionals, the Rio Pro’s superior card printing quality is enhanced by ICC profiles that seamlessly map colours between software and the printer. The clear 4-line display provides intelligent user information and interaction. Built for heavy use, the Rio Pro sets the standard for secure ID card printing. High capacity hoppers (up to 200 cards) and a fast, reliable print engine can produce more than 150 high quality, secure, full colour cards per hour. Included with all Magicard printers, HoloKote® is patented technology that frosts a secure watermark onto the card’s surface during printing. The Magicard Rio Pro ID card printer offers the option of customising this watermark to your organisation’s unique logo or security design. 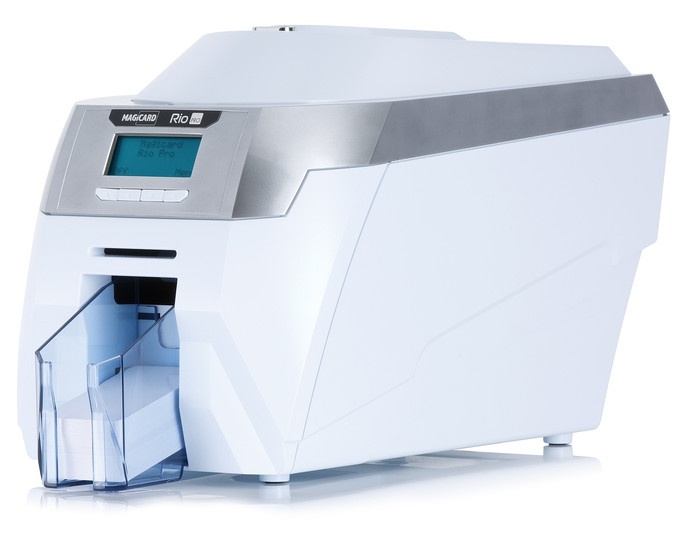 The Magicard Rio Pro can be equipped with a range of card encoding devices to write secure electronic data to cards at the point of issuance. Smart card encoding options include contact chip, MIFARE, DESFire and iClass. Specialist high-security smart card encoders, such as EMV accredited devices, can also be fitted for the in-line personalisation of payment cards. The Rio Pro can also be supplied with a magnetic stripe encoder built-in. Magicard Rio Pro with UltraCoverPlus – our promise to keep you printing. The reliability of our well-established print engine enables us to offer you a comprehensive 3 year warranty with full telephone and online support. This includes a free replacement for any printhead damaged over the lifetime of the warranty. In the unlikely event of a field failure, we will send you a replacement loan printer whilst we repair your existing device. *Available in the EU, North America, Australia and other selected territories. Elsewhere 2 years depot warranty. Education ID - The Rio Pro’s flexibility, speed and versatility, combined with its security features make it ideal for student IDs, from elementary schools through to university campuses. Photo ID - The Rio Pro’s custom HoloKote feature enables the addition of a customised logo or security design to every card printed – making it ideal for applications where secure visual identity is required. Payments ID - Payment cards can be securely printed and encoded instantly, in-branch using the Rio Pro fitted with an in-line EMV encoder. Physical Access Control ID - A Rio Pro fitted with an in-line smart card encoder can write physical access data to a smart card at the point of issuance. Facilities ID - The Rio Pro’s customisable HoloKote visual security watermark, combined with an in-line electronic encoder can rapidly produce high security ID cards for critical facilities and infrastructure. Logical access ID - A Rio Pro fitted with an in-line smart card encoder can write logical access data to a smart card at the point of issuance. Magicard MA1000K-SCRATCH OFF Cartridge Ribbon (1000 Prints) - 1000 prints per roll, Scratch off Cartridge Ribbon, For use with the Magicard Enduro3E, Pronto and Rio Pro card printers. Magicard MA1000K-SILVER Cartridge Ribbon (1000 Prints) - 1000 prints per roll, Silver monochrome Cartridge Ribbon, Compatible with the Magicard Enduro3E, Pronto, Rio Pro 360, Rio Pro, Rio Pro Secure and Rio Pro Xtended card printers.